ORIGINAL 1975 JAWS 14x36 INSERT MOVIE POSTER. Poster Condition: C8 (Condition A, very Fine, never been used). Signed by director Steven Spielberg in blue permanent sharpie marker. This is an original 1975 US insert poster. 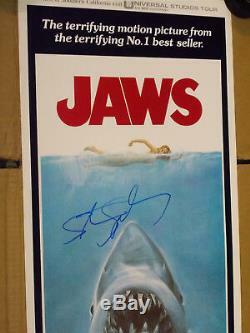 It is extremely difficult to find genuine authentic original JAWS insert posters, this is the first one I have seen signed by Steven Spielberg. This is the holy grail of JAWS items, appealing to both the avid poster collector that collects vintage classic movies and also incorporates autograph collectors into the mix. Arguably the most recognizable poster image of all time. 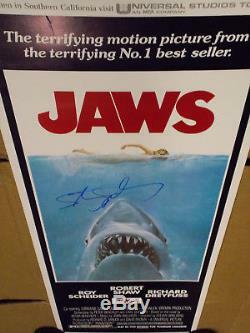 The item "JAWS Original AUTHENTIC 1975 VINTAGE Insert Movie Poster Signed Steven Spielberg" is in sale since Friday, October 13, 2017. This item is in the category "Entertainment Memorabilia\Movie Memorabilia\Posters\Originals-United States\1970-79". The seller is "gt-wholesale" and is located in Philadelphia, Pennsylvania.